Dutch ovens are cleaned and oiled, tensts put away, ropes dried and stored, and its back to normal life. Mondays can be a real downer after a fun weekend of camping. The patrol that planned the outing laid out a day of competitive games. They kept score and had an awards ceremony on Sunday morning. Even though it was a wet, muddy day, everyone said they enjoyed it completely. I didn't get to see the games because I was leading Scoutmaster Specific training, but I got to camp just in time for a wonderful jambalaya dinner with the adults on Saturday evening. The campsite was wonderful! It was all woods with small open areas about 70-100 feet apart connected by trails. 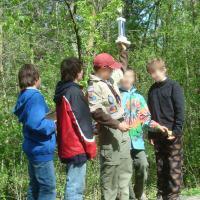 Each patrol had its own area so the scouts were spread out a lot more than most of the BSA camp sites we've used. It makes it much easier to see which patrols are performing well and which are struggling with cooking, sanitation, tenting, and anything else that can be a challenge. Saturday's campfire went well. I was asked to bring ingredients for three simple cobblers. I brought chocolate, yellow, and lemon cake mixes, Coke, Squirt, and Mountain Dew soda, and cherry, apple, and pineapple pie filling. The scouts chose how to combine them and then one scout did all the cooking. This was his first time using dutch ovens but he dug the coals, stacked the ovens, rotated them, and kept the fire going. The desserts were awesome! I was very surprised at how nice the pineapple/lemon/squirt one smelled and tasted - my favorite. At the next troop meeting, I've got this spoof merit badge to present to the scout for his extra effort in making the dessert for the troop. Hopefully, it will be a little incentive for others to step up to help when opportunities arise.